Teachers have about a million little supplies that we use daily. I don’t know about you, but I always seemed to end up with at least one cluttered, unorganized desk drawer full of supplies. Pens. Stickers. Paper clips. White out. Extra staples. Post it notes. Tape. Binder clips… The list could go on and on. 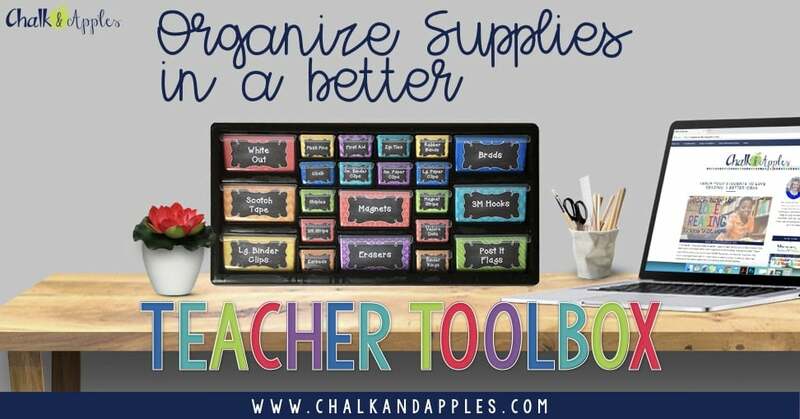 Whether you’re thinking of ditching your teacher desk, or you’re just trying to get organized, a teacher toolbox is the perfect answer! Today I’m sharing how to make a teacher toolbox that’s durable enough to last. Teacher toolboxes have been around for a while. In fact, my very first TPT resource ever was a set of labels for my first teacher toolbox. Given how popular they’ve been, I’m often surprised to hear that teacher friends either haven’t heard of them or don’t have one. Poor, sad toolbox. As you can see, the tape definitely lost its stickiness over the course of the year. One of my labels was even lost! You can grab all the supplies on Amazon or at your local hardware store, and the labels are in my TeachersPayTeachers shop. Create your toolbox & make it last. If you don’t want to keep the grey color that the toolboxes come in, you can spray paint it any color you want. Take out the drawers & set them aside. Wipe down the entire toolbox with a dry, lint free cloth to remove any dust. Spray with light, thin coats of spray paint formulated specifically for plastic, like Krylon Fusion. (The other stuff flakes and peels off.) I needed 3 coats to completely cover my toolbox. While your paint is drying, edit and print out your teacher toolbox labels. You can print them on plain paper, no cardstock necessary. Before you cut out your labels, spray the entire page with a light coat of aerosol hairspray. Any brand will do. I just used the Bravado hairspray that was already on my counter. (BTW – it’s a.maz.ing hairspray!) This seals the ink on the page so that it doesn’t run and make a mess of your toolbox. 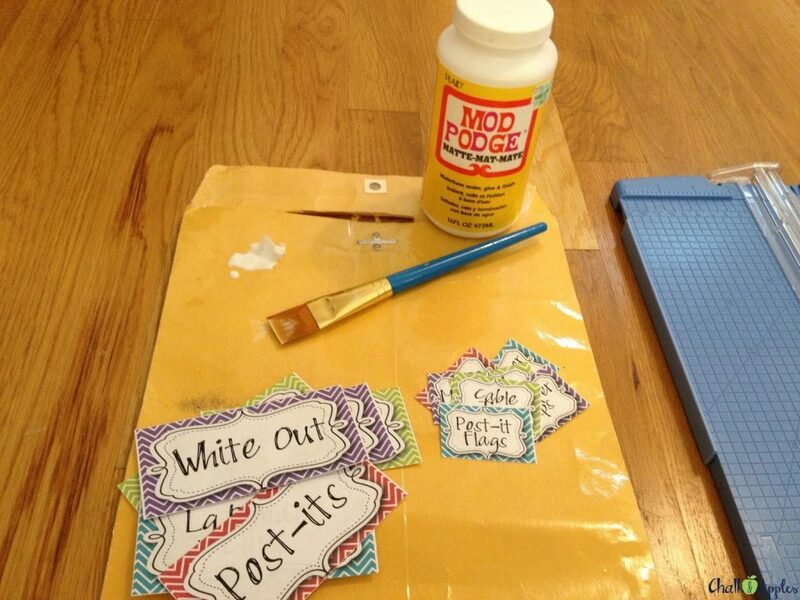 Once the hairspray dries, go ahead and cut apart your labels and get your Mod Podge supplies together. I just used an old envelope to paint on, since that was what I had handy. 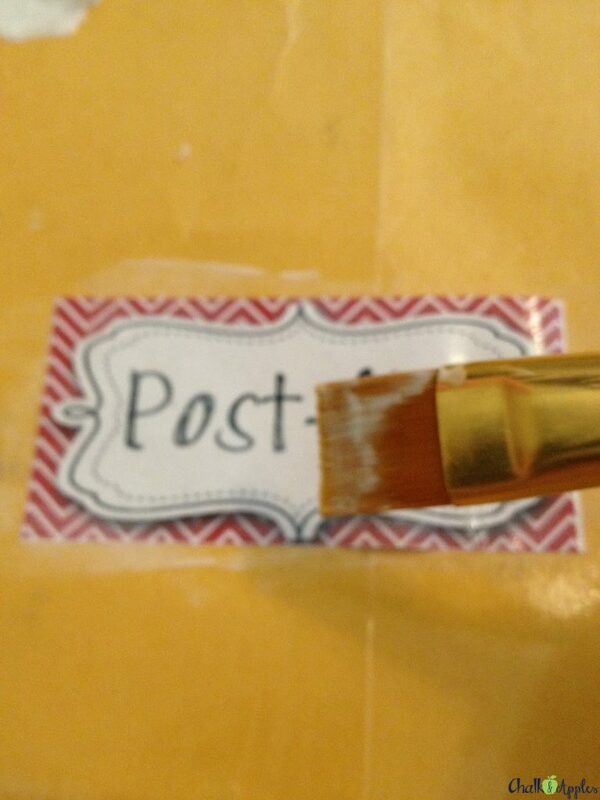 Paint a thin coat of Mod Podge on each label. I’ve found that a super thin coat is key. You want to cover the entire label, but don’t soak it with globs of Mod Podge. Press the label onto the inside of the drawer. Don’t worry if it doesn’t go on straight, you have a couple of minutes to reposition the label before it starts to dry. Once the labels and organizer are all dry, pop the drawers back in, and you’re ready to organize! So, now that your toolbox is ready to use, what goes inside? I’m sure there are things I’m forgetting. 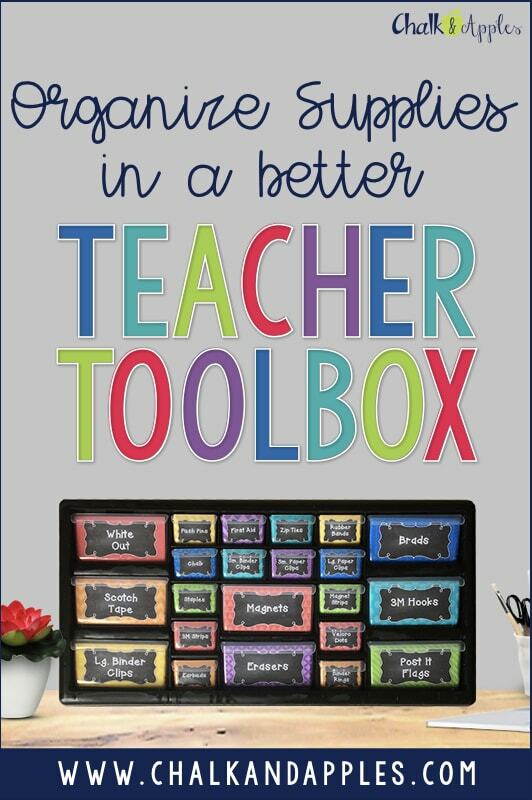 That’s why all of the teacher toolbox labels in my TPT shop are editable. Add anything that’s cluttering up the junk drawer in your desk, and make it work for you! Kristen, thank you for sharing this great idea! I'm curious, if you need to change out a label (maybe you need two drawers for rubber bands and don't need one for erasers now), it there a great technique for removing them as far as the mod podge on the drawer goes? Do you need to clean it with anything before adding the new label? Love Modge Podge! Thanks for the advice. I'll be putting my tool box together soon!